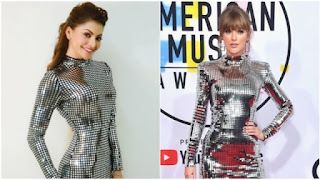 Urvashi Rautela tries copying Taylor Swift , judge for yourself! Former Miss Universe for the year 2015 Urvashi Rautela is recently in London for her photo shoot. Posing in a silver shimmer dress exactly the same spotted on Taylor Swift during AMA , paired with shimmery thigh high boots . Looks like Rautela tried recreate the look from the event but it's no match , tbh! 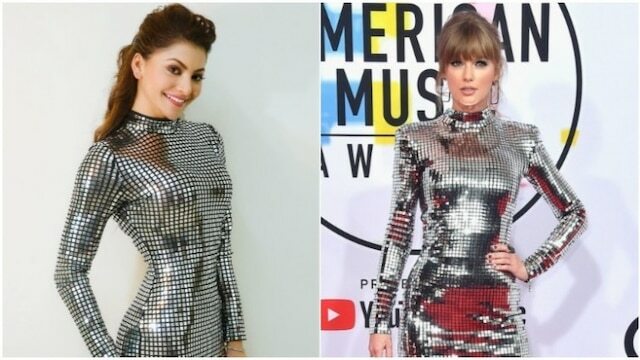 The doppelganger of the TS worn silver metallic , Rautela's dress was from an online fashion brand Mad About You. She paired it with Giuseppe Zanotti shoes and accessories from Anmol Jewellers . The original dress was from Balmain and had silver reflective panels . The pop star paired the dress with thigh high silver reflective boots also from Balmain.